WR Michael Thomas vs. CB Xavier Rhodes – Michael Thomas earned a 92.5 overall grade for the season thus far, No. 2 among 120 eligible wide receivers. He maintained his stellar performance through Wild Card weekend, and his 90.8 overall game grade was the highest among all players in that game. Thomas was targeted on 27 percent of his routes run on the season, tied for the fifth-most among 93 qualified wide receivers. He’ll be covered on the majority of his routes by cornerback Xavier Rhodes. Rhodes earned an 83.9 overall grade for the season, tied for 28th among 120 eligible cornerbacks. He allowed 1.43 yards per coverage snap, tied for 43rd among 124 qualifying cornerbacks. RB Alvin Kamara vs. S Harrison Smith – Alvin Kamara’s 90.5 overall grade for the season was second-best among 61 qualifying running backs. His 108.5 elusive rating was the highest among all qualifying running backs, and his 2.81 yards per pass route run was the highest figure among running backs by a significant margin. 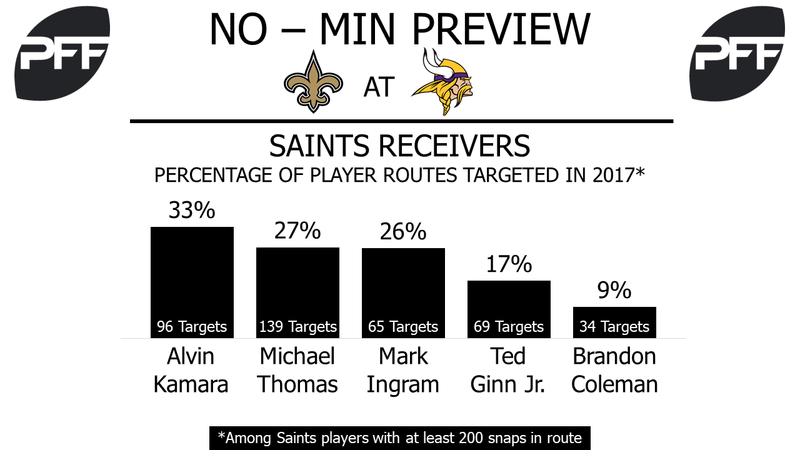 Safety Harrison Smith could be Kamara’s most difficult matchup yet. Smith’s run-stop percentage of 7.4 when lined up within eight yards of the line of scrimmage is 15th out of 79 qualifying safeties, but it’s his coverage performance that’s most impressive. He allowed 0.25 yards per coverage snap, eighth-best among 87 qualifying safeties, but on far more targets than anyone with a better mark. The next-best mark by a safety with 40-plus targets was Micah Hyde’s 0.47. Smith’s 17.2 combined tackling efficiency in the running & passing game was the fifth-best figure among 73 qualifying safeties. T Terron Armstead vs. Edge Everson Griffen – Terron Armstead missed the first four games of the season recovering from offseason shoulder surgery, and after some sub-par performances in his first few games back, he stepped up his play dramatically in the second half of the season. From Week 10 through Week 17 of the regular season, Armstead’s 97.2 pass-blocking efficiency was the sixth-best among 80 qualified tackles, as he allowed only six total pressures in those games, and he was the only qualifying tackle in the Wild Card weekend games to not allow a single pressure. Defensive end Everson Griffen presents a significant challenge this week. His 90.6 overall grade is tenth-best out of 108 qualifying edge defenders, and his 10.1 pass-rushing productivity rating was tied for 38th out of 107 qualified edge defenders. WR Stefon Diggs vs. CB Marshon Lattimore – The most intriguing battle in the passing game will be between two of the best at their respective positions this season. Diggs was one of the best receivers when targeted this season, as he generated a wide receiver rating of 120.4 when thrown at, second-best among receivers with at least 82 targets this season. The Saints had best be aware of him in the red zone, as since the beginning of 2016 he has caught all 23 of his targets in the red zone for eight touchdowns, and no one has a better wide receiver rating than Diggs’s 132.2 in the red zone. 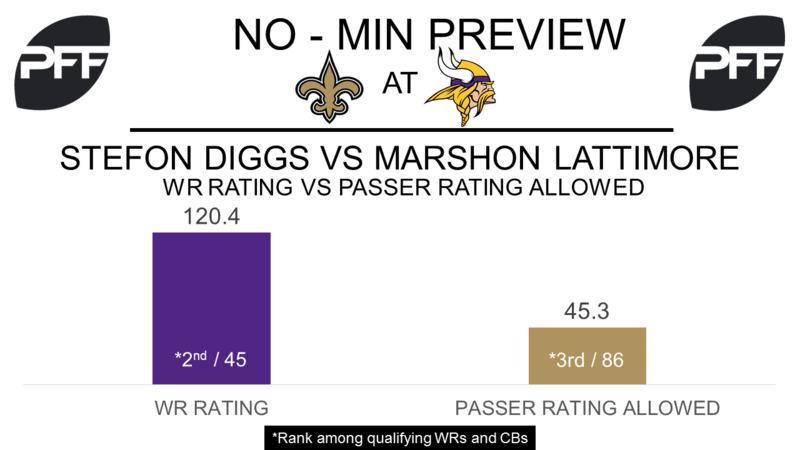 With one of the best rookie seasons PFF has seen, Lattimore will make it difficult for Diggs to have an impact on this game. Lattimore proved to be one of the best cover corners in the NFL and finished the season ranked as the fourth-best cornerback with an overall grade of 90.7. He was one of only six cornerbacks not to allow a touchdown in their coverage all season and his passer rating allowed of just 45.3 was the third-best mark by a corner in 2017. T Riley Reiff vs. Edge Cameron Jordan – Reiff is coming off the worst season of his career and will have a difficult game ahead of him, as he will face off with the highest-graded edge defender this season. Reiff struggled with both pass and run blocking and graded poorly in both categories this season (48.1 pass-blocking grade, 51.4 run-blocking grade). He also finished the season with a pass-blocking efficiency of 94.5, a mark that ranked 33rd among 55 offensive tackles. Jordan, on the other hand, dominated in both the pass and run game, finishing the season with the third-best run-defense grade (92.3) and third-best pass-rush grade (92.3). Despite only ranking 20th among edge defenders with a pass-rushing productivity of 10.8, his 74 total pressures were the eighth-most by an edge defender in 2017. TE Kyle Rudolph vs. LB Craig Robertson – Rudolph was one of the best receiving tight ends during the regular season, his receiving grade of 80.6 ranked sixth this year. He had the best drop rate of any tight end and only dropped one of his 58 catchable passes for a drop rate of just 1.72. Rudolph’s 116.4 rating when targeted was the ninth best by any tight end with a minimum of 500 snaps this season. Craig Robertson will be charged with keeping his production from having a major impact. Robertson held his own in coverage this season and ranked 27th among linebackers in 2017 with a coverage grade of 77.1 and only allowed a passer rating of 95.1 on passes into his coverage, the 17th-best mark by a linebacker this year.